eBay is one of the pioneers of online commerce and this site empowers lay individuals to buy, sell, and trade items online from anywhere, anytime. The website began operations in September 1995 and has since seen been the venue where many quirky as well as expensive items have been sold. 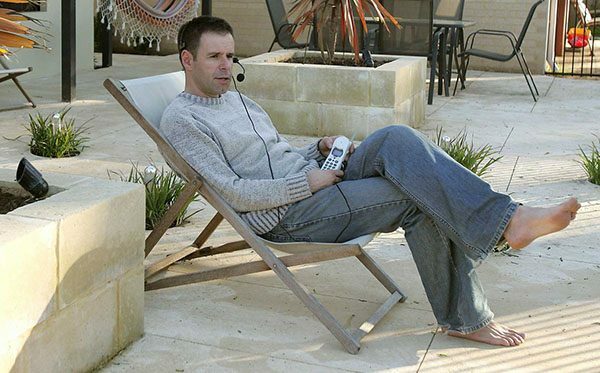 Let’s take a look first at the funniest, zaniest, and weirdest items ever sold on eBay as revealed by Independent.co.uk. To start, a grilled cheese sandwich that has the face of Virgin Mary sold for $28k in 2004. People have even put up for sale haunted items like a “ghost in a jar” and a “possessed” rubber duck. If you have a philosophical bent of mind, you might be surprised o know that the “meaning of life” is worth just $3.26 as indicated by a sale in 2000. People will do anything to possess collectibles of their favorite movie or pop stars. A Britney Spears fan shelled out $14k to buy a chewing gum spat out by the star during a concert in 2000. Justin Timberlake is another popular music figure and one of his fans had no hesitation in coughing up $1,025 to buy the pop sensation’s half-eaten sandwich. If you are enterprising like Andrew Fischer, a web designer from Nebraska, you can make good money by showcasing ads on your body. Fischer received $37,375 to display an ad for the snoring treatment SnoreStop on his forehead. Finally, a British girl put up her virginity for sale to fund her college studies. A kind buyer gave the money but did not avail the offer to help out the young woman. Statista.com indicates that eBay’s annual revenue was $9.567 billion in 2017, up from $8.979 billion in 2016. The bulk of this revenue is generated via marketplace transaction fees. Top selling items on eBay in 2017 include mobile phone screen protectors and cases, flashlights, bedsheets, and other everyday products. The highest average price for a category is $1,012 which is for industry and construction items. 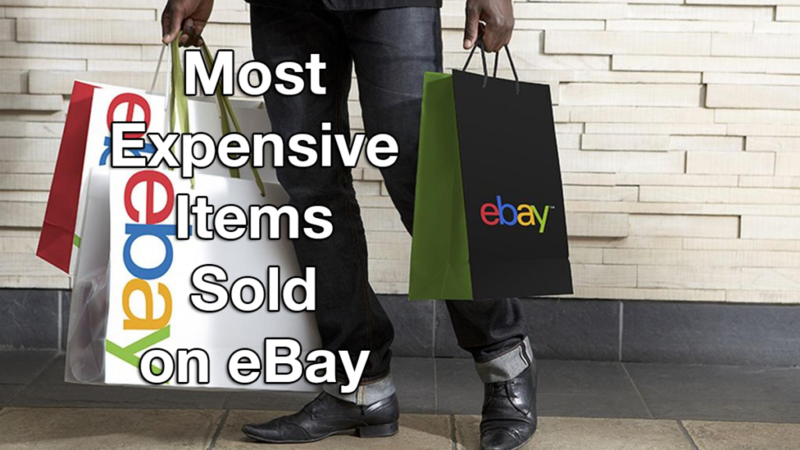 Now let’s get down to the nitty gritty and begin our countdown of the most expensive items ever sold on eBay as of 2018. Would you sell your life on eBay whatever be the amount? Writer and travel enthusiast Ian Usher did just that and made $309k. He was struck by a mid-life crisis and therefore took the inspired decision to put up his life for sale. The money he got rejuvenated his life and he made a fresh start, traveled to many new places, and even wrote two books on his interesting experiences. Ian Usher auctioned his entire life including friends, job, and car on eBay, Australia. It was perhaps the best decision of his life as he got a lot of money, traveled to dozens of countries, bought his own Caribbean island, and met a lovely woman who won his heart. Usher also got to meet maverick Richard Branson, owner of the Virgin business group. He made the most of life during his travels learning how to fly a plane, joining the Mile High Club, diving with sharks, and running with bulls. The best part is he also got a small role in a Hollywood film. In fact, life became one big one adventure for him as he met his goal of going through 100 new experiences in 100 weeks. Shoeless Joe Jackson is one of the legends of American baseball and he got his nickname when he once played without shoes which were giving him blisters. In 1919, he courted controversy when he was accused of throwing that year’s World Series to receive a bribe. In 2001, his nephew put up his Black Betsy bat for sale on eBay. The bat fetched $577,610 which puts it in this list of most expensive items ever sold on eBay. The buyer was businessman Rob Mitchell who owns a marketing company and displays the bat in his offices. He thinks this is a good investment as he estimates the bat’s real worth to be between $1.7 million and $4 million. For the record, Mark McGwire’s 70th home run ball fetched a record $3.05 million. Black Betsy was authenticated as the real thing by a bat expert. Other bats used by Babe Ruth and Shoeless Joe have gone for more than $100,000. Only 399 Ferrari Enzo supercars have been made which makes them a rare collectible. In 2004, one of these masterpieces went up for sale on eBay and attracted bids from automobile aficionados, car collectors, and other well-endowed adrenaline junkies. A Swiss gentleman won the prize by shelling out $1 million which was just $55 more than the next highest bid. The price of this car model has since skyrocketed which makes it a great investment for the lucky winner. For instance, another Ferrari Enzo was put up for $3.2 million. Many experts estimate that even this amount is less and that the price of the car will continue to rise in value in the coming years. Baseball cards are much sought after by collectors and this rare Honus Wagner card went for $1.1 million in 2000. The American Tobacco Company issued only 200 Honus Wagner cards after the star dissociated himself with the company as he was against smoking and wished to convey this message to his fans. Baseball fan Brian Seigl parted with $1.1 million for this card which however pales before the $3.12 million fetched by a 1909-11 T206 Honus Wagner sold via Goldin Auctions. The T206 Honus Wagner is considered the Holy Grail of baseball cards. It has repeatedly set record prices for a baseball card. A PSA 8 copy of the card owned previously by hockey star Wayne Gretzky sold for $2.8 million. So, Brian Seigl is onto a good thing as he can safely expect his investment to grow in value in the coming years. Real estate is a popular category on eBay. Big properties fetch huge amounts on this auction site. However, you may be surprised to learn that someone put up a whole town for sale on eBay. This private town is Bridgeville in California and it is spread over 83 acres and hosts just eight houses, a café, a post office, and 30 residents. This lot was put up for auction for $1.77 million by the owning Lapple family. The town again went up for sale as the buyer named Krall wished to dispose it. He thinks the property is ideal for ventures such as a retreat center, corporation, college, movie company or religious group. If you are planning to venture into any of these activities, check out eBay to learn if Bridgeville, CA is still up for grabs. Given the dire doomsday scenario in this nuclear age, it is good to be prepared for any eventuality. Realtors Bruce Francisco and Gregory Gibbons understood this reality and prepared a property in New York State’s Adirondack Mountains that was a former missile silo base. They built a luxurious house here whose highlight is a well-protected underground bunker that can keep you safe during war or any other emergency. They expected to make $18 million from the property but had to be satisfied with just the $2.1 million it fetched on eBay. Insurance broker Bobby Cave made a handsome $2.5 million in 2003 by selling the small town of Albert, Texas that hosts just five residents. The town has a hoary history and functioned as a stop on the Fredericksburg-Blanco stage route as well as a hub in the President’s Ranch Trail. Cave had bought the property for just $216k so he made a sizable profit from his smart investment. Bobby Cave spent a lot of money to spruce up and restore the 13-acre town which is located 50 miles north of San Antonio. For instance, he constructed a tavern that is open on weekends and restored a public restroom, three-bedroom house, tractor shed, dance hall, and pavilion. In addition, Cave announced he will help the buyer to convert the property into a tourist destination by building cabins and a restaurant. His good intentions paid off and he made a decent sum for his efforts. Warren Buffet is one of the richest men on the planet and time is precious for him. Plus, he is perhaps the savviest investor in history so anybody keen on making money by making smart investments will be eager to spend some time with him to pick his brain and gain sound advice on where to put their money. Buffet does his bit for charity by auctioning his lunch time once a year. In 2010, an anonymous bidder jumped on the opportunity and spent $2.6 million to have lunch with Buffet. The proceeds from the annual lunch meetings are donated for a good cause. In fact, Buffet has raised more than $25 million via these lunch auctions. The standard place for this lunch is Smith and Wollensky steak house in New York City which also donates a sizable amount to charity. However, the venue has moved elsewhere depending on the preferences of the anonymous winners. Jets are an expensive investment and in 2001 an Africa-based charter flights firm shelled out a whopping $4.9 million to buy a Gulfstream II plane on eBay. The aircraft was offered by Texas-based Tyler Jet and it includes luxury facilities for 12 passengers. At that time, this was the most expensive online purchase on eBay beating the previous record of $1.65 million. eBay’s aviation category has listed a number of aircraft for sale including those owned by celebrities such as former US president John F. Kennedy and Hollywood star John Travolta. The aviation category also lists parts, engines, pilot gear, avionics equipment, memorabilia, and clothing. Russian billionaire Roman Abramovich shelled out an astronomical $168 million to buy the 405-feet-long Gigayacht designed by naval architect Frank Mulder. The marine craft is the last word in luxury as it hosts a helicopter pad, retractable glass elevator, spa, office area, movie theater, jetstream swimming pool, gym, eight guest cabins, children’s cabin, 10 multilevel VIP suites, and a 3,000 sq. ft. master suite on the deck. The transaction was completed with Florida-based 4Yacht brokerage firm. Other amenities on the yacht include a ski boat stored in the garage and two large guest tenders. In addition, there is facility for a submarine to be launched via dry dock. The yacht has a cruising speed of 16 knots and can reach a maximum speed of knots. The manufacturers sell the craft for $196.5 million, so Abramovich saved a lot of money by spending just $168 million on it. He is an oil magnate in Russia and is also known for his business ventures in the UK. Abramovich collects luxury yachts as a hobby so it is not surprising that he decided to invest in this expensive item. HOW DO YOU SHIP THESE????? ok, he actually bought it, but….how do I bring this over to the USPS office, and where do i get so much bubble wrap!? also where the heck can i grab a 40ftx20ft shipping label !!? ?